Nestled in the heart of Old Havana, Paladar Doña Eutimia has become a culinary and cultural landmark in the city´s thriving arts district amongst tourists and artists alike. 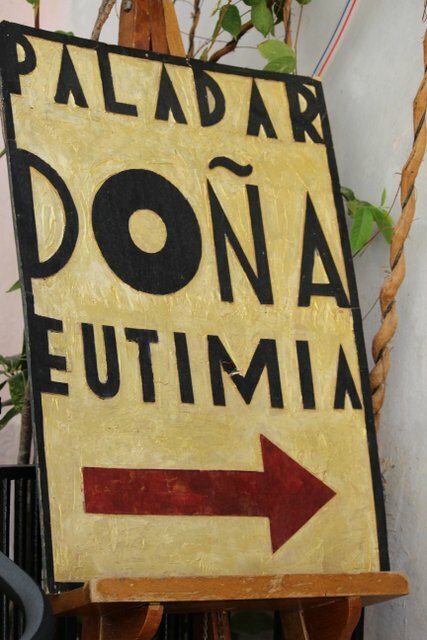 Doña Eutimia opened its doors in early 2012, however, like everything in Old Havana, its story begins much earlier. The roots of Doña Eutimia date back to the 1970´s, just over a decade after the triumph of the Cuban Revolution. Many young artists who had not left to the United States or Europe established studios and galleries in Old Havana around the Plaza de La Catedral. Their center was the Experimental Graphics Workshop, which still functions today, located right next door to Paladar Doña Eutimia. These young artists often met and ate lunch at the house of the namesake of the paladar, a woman called Doña Eutimia. Today, a few decades later, the artists decided to take advantage of the new laws allowing for private restaurant ownership and try their hand at recreating their memories of yesteryear. Doña Eutimia is present, in painted form, at the top of the iron spiral staircase on your way to the bar. You can also find her presence in the kitchen. The recipes for the black bean potaje, the ropa vieja (which is made from shredded mutton instead of pork or beef), and the french toast were all written by her hand. The fare offered at Doña Eutimia is typical Cuban criolla. The three Ps: pollo, puerco, y pescado (chicken, pork and fish) dominate the menu in a variety of preparations. Hidden at the bottom of the first page, right bellow the starters, is an extremely Cuban dish, the Arroz a la cubana. It is composed of a couple of fried eggs, white rice, and fried plantain with a tomato based creole sauce. During the food shortages of the economic crisis in the 1990´s (a time known in Cuba as the “Special Period”) this simple food became the staple diet for many households. Order this and the Cuban staff will know that you are serious about getting to know their country first hand. Lunchtime is when you want to take advantage of the quick and efficient service at Doña Eutimia, to have time to become familiar with the surrounding arts scene. Practically sharing an entrance with the paladar is the Experimental Graphics Workshop where you can watch young engraving artists rolling metal, wood, and stone plates through presses older than their grandparents. The final product of their efforts is for sale, of course. The Plaza de la Catedral, a few steps away, is dominated by the baroque façade of the Catholic Cathedral that gives the Plaza its name. This is where you can find the Museum of Colonial Art, as well as the Wilfredo Lam Contemporary Art Center, home to a permanent display of Cuba´s most celebrated modern painters plus temporary international exhibits. There are also numerous art galleries on every street leading to the Plaza, offering everything from mass produced painted scenes of Havana street life and old cars, to original pieces for the serious collector. If you do decide to have dinner at Doña Eutimia, you can still shop art afterwards. Walk towards Capitolio on Empedrado Street and you will find several late night art galleries hoping your wallet has been sufficiently lubricated by Doña Eutimia´s frappe mojitos. 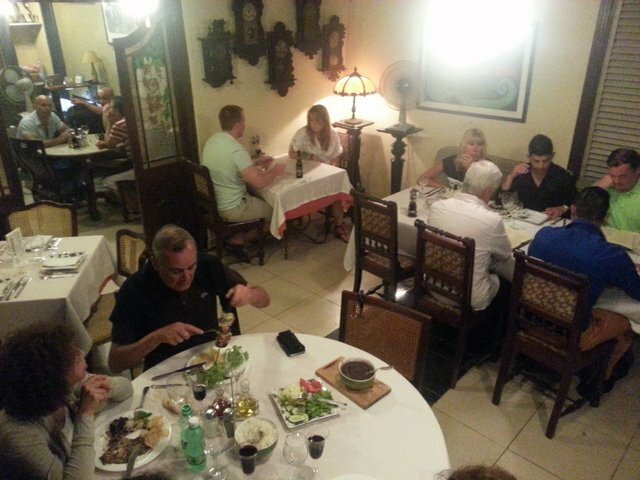 Doña Eutimia is open every day for lunch and dinner. Located at the Plaza de la Catedral on a side street that dead ends to the Experimental Graphics Workshop (Callejón del Chorro 60C). Watch out for lots of high-pressure salesmen with menus in hand trying to steer you toward another paladar. Dinner reservations are recommended during tourist season. Call (7) 861-1332 or email d.eutimia@yahoo.es.